Our standard CD display racks have a professional appeal and the tall back offers the client an opportunity to customize with company logo or a call to action message for impact. 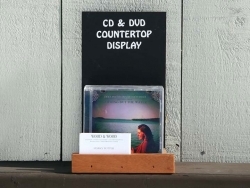 Each CD counter top display holds up 10 to standard CDs or 6 DVDs. The front mahogany piece is a routed groove for displaying business cards or take away coupons. These retail display racks are a good solution for showcasing featured newly released CD’s or in store promotional specials. *A company logo or call to action message can be applied to the backboard for an additional charge. Wood & Wood is ready to collaborate with you on the designing and fabricating a custom retail display rack. A minimum order of 20 is required for custom runs of these CD counter display tops. Please send along your ideas, dimensions, and requirements along with the following information and we will get started. Logo if provided, artwork should be emailed in Adobe Illustrator in vector format with fonts changed to outlines. For custom CD counter top display we will bill $65 per hour for our design time. 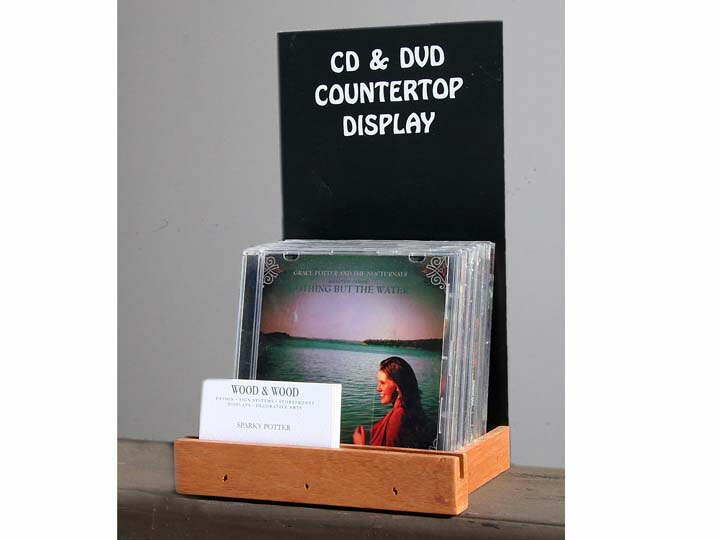 If you order a CD counter top display that is in stock, we can ship usually within 1-2 weeks. For custom orders, please allow 4 – 5 weeks. Vermont residents add 6% sales tax to merchandise. Once one of our designers has reviewed your comments, they will call to discuss layouts and price for your CD display racks. Fabrication will begin once the client accepts proposed price and receipt of a non-refundable 50% deposit. Shipping costs will be calculated on an individual basis.